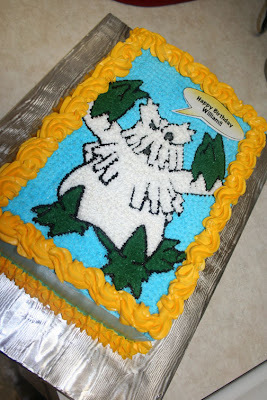 This cake was made for my friend Tricia's son, William. William just turned 9 years old and wanted his favorite Pokemon character as his cake. I used the pin-prick method again. I know, the star tip. It's so much easier to use the star tip on character cakes though! Most kids don't like fondant and I figured a FBCT would be a little difficult considering the detail on this cake. Anyway, he loved it so that's all that matters! This is the ever popular oreo cookie cake - and I had a piece, it was pretty good! Not that I'm biased or anything! You have really been making some awesome cakes. I made a cake for my friend's birthday party today--it took me ALL day. And the cake was already made and frozen! Question: Do you know why classic buttercreams weep? I made a whole egg version instead of my typical Swiss Meringue Buttercream. It's been driving me crazy. The cake was perfect until all the details I had piped on started to fall off and drip color down the side of the cake. I had to freeze it! Do you have pictures up yet? I don't know why I just asked you that instead of looking, I will look in a second. You know, I really don't know much about Swiss Meringue or Italian Meringue buttercreams. The only recipe I have ever used is the Wilton snow white buttercream and I've modified that a bit to my liking. What was the recipe that you used? I have some theories but I want to know what you used first.